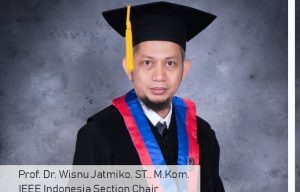 A proud achievement was again inscribed by Professor of UI (University of Indonesia) in the field of Artificial Intelligence and Robotics Prof. Dr. Wisnu Jatmiko. Prof. Wisnu was successfully elected as Chair of the IEEE Indonesia in 2019 based on the results of a vote of 50.67% forum members or 301 IEEE members. The determination of the Chairperson of the IEEE Indonesia was carried out on the 4th March 2019 ago. IEEE is the largest organization in the world in the fields of electricity and electricity, telecommunications, computer engineering and other disciplines dedicated to producing a variety of technological innovations that benefit the world community. IEEE was established in 1884 and has an office in New York with an operations center in Piscataway, New Jersey. Now, the IEEE has more than 430,000 members spread across 160 countries. IEEE members consist of many engineers and scientists. Prof..Wisnu said, “The progress of a nation and country can be seen from the mastery of Science and Technology (Science and Technology). Developed countries and the pioneers of world civilization are countries that master and develop science and technology. So from that Indonesia must be able to make science and technology as one of the foundations of national development. “In his leadership, Prof. Wisnu will carry out a number of missions to strengthen the research culture especially in the realm of higher education. IEEE Indonesia is expected to be able to take advantage of its strategic role in enhancing innovation that is beneficial for the nation. Prof. Wisnu is an expert on robotics and UI artificial intelligence systems that have been involved in scientific development through research activities. Prof. Wisnu routinely conducts research then publishes it in journals and international conferences indexed by Scopus and is registered in the IEEE database. Until now, the total number of scientific articles produced has reached more than 100 publications. In addition to scientific publications, Wisnu has also written 11 books in the field of Computer Science, 6 scientific property rights for research products such as Smoke Source Search Robot Simulator, Fetal Growth Telehealth System, Distributed Traffic Light Regulatory System Prototype, E-Cardio, etc. . These studies received recognition in 107 and 108 Prospective Innovations of Indonesia. Besides that, Prof. Wisnu was also the 2014 National Science Ambassador and 2015 Habibie Award recipient. With the election of Prof. In this international network, Wisnu further strengthens UI’s steps to enter into a strong and broad global academic network and encourages the spirit of UI academics, especially students to improve research and innovation productivity. The other IEEE Indonesia Section team is Dr. Kurnianingsih (Deputy Chairperson); Dr. Ir. Noor Akhmad Setiawan (Secretary) Dr. Muslim Pack Lhaksmana (Treasurer).